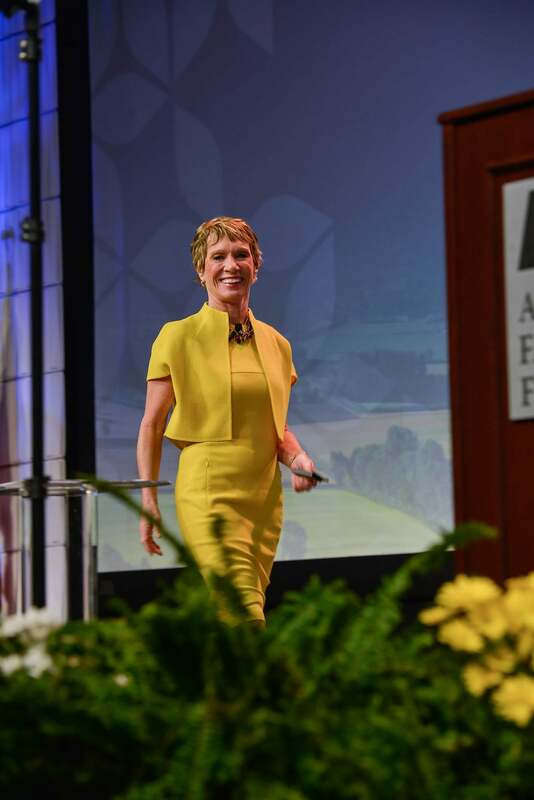 Farmers know a thing or two about entrepreneurship and at this year’s American Farm Bureau Federation Annual Convention in Orlando, Florida, attendees had the opportunity to get to know one of the most successful entrepreneurs in the country. Barbara Corcoran stars as one of the “Sharks” on ABC’s hit TV show, SHARK TANK. The New York City Real Estate mogul was quick to tell her audience that she knows nothing about farming. Instead she offered advice on building a business, branding yourself and forging ahead when the chips (or in our case, the markets) are down. those that are just getting by, is the ability to not feel sorry for themselves after failing. As founder of the best-known brand in New York City real estate, Barbara knows that a recognizable brand determines half of your success. That’s why she used media to help get her name out there by sending stories to the New York Times about celebrity’s buying and selling homes. Just as our society is curious where George Clooney is buying a home, it wants to know where their food comes from and whether or not it’s safe. We know that many of those concerns come from the use of media and fear-based marketing campaigns used by food companies. Take Barbara’s advice and be seen as the expert that you are. Barbara started with just $1,000 that she borrowed from her boyfriend at the time. They built a business together but that ended when she found he was cheating on her with her secretary. (Suddenly your life didn’t seem so complicated, right?) He offered her advice that has always kept her in business, “You’ll never succeed without me.” Through three real estate recessions, Barbara said she would think of those words for motivation. She said she would rather die than allow him to be right. Barbara’s rags-to-riches story about how she took $1,000 and turned it into a business worth $6 billion is a true inspiration to farmers. This NYC real estate mogul expert may be far from the farm, but her big city advice can easily be applied to our industry. Do not let failure get you down, use media to tell your story and recognize that great things often come on the heels of rejection.